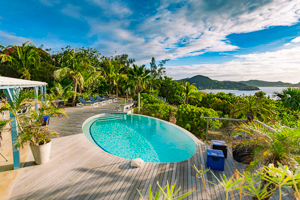 Villa UJV 332, also known as Villa Mandarine Bleue, is one of Pointe Milou, St Bart's real gems. The villa offers a 270-degree view with both sunrises and sunsets. Decorated in blue and white and is very comfortable. Each bedroom is private and has a spacious ensuite bathroom. One bedroom has an ocean view and the other has a garden view. There is also a 3rd guest bedroom off the living room, which is best suited for a child or nanny. This room is available on request for $300 per week. With seating for 8 people in the dining area, the house is perfect for entertaining. Villa UJV 332 is a wonderful place to spend a vacation. SPECIAL NOTE: this villa is only rented at 2 bedroom rate over Thanksgiving.